This is Ben’s last year of elementary school. One of my main goals for his 5th grade year was to move him toward more independence in homeschooling. Creek Edge Press provides a simple tool for homeschoolers to facilitate more “discovery-based, research- oriented and independent” learning. Designed for grades K-8, and combining the Montessori, Classical and Charlotte Mason methods, Amy Kate Hilsman, a homeschool mom of 5, began assigning her oldest daughter “task cards” in the first grade. Having used the Montessori method for her preschool years and inspired by The Well-Trained Mind, she developed the Task Card system to combine the 2 methods. Because of the possibility of adding living books and using narration, Charlotte Mason’s methods are also loosely integrated. 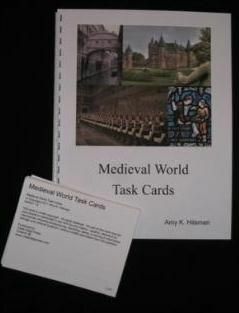 We received the Medieval World Task Card Set, covering the Fall of Rome through the Reformation and Renaissance. In this set I found a set of approximately 34 Task Cards and a handy spiral bound Introduction book. I began by familiarizing myself with the book. The idea is to assign one Task Card per week, covering a set in about a school year. Certainly that schedule is flexible. The Introduction explains the methodology behind the Task Card system, gives tips for how to approach the tasks, and shares ideas for how to prepare the learning environment. Further Reading: there is a nice book list in the Information book. We checked out books from the library and also used books we had in our own library. This is not a buy-it-and-go kind of system. There is a measure of planning ahead involved and resources you will need to have in place, including a large variety of school supplies, maps and a globe, and a good library system. You can read the Scope and Sequence, Book List, and Supporting Links on the website. The author says she began using Task Cards with her daughter in the first grade. While I see some value to that, I think it would be difficult for children younger than about 3rd grade to really use this system independently, which is actually a good thing as far as I am concerned. In those young grades, it’s my preference to be in the thick of things with homeschooling. For this age, I see the Task Cards more as simply to a nice checklist of tasks for the teacher to work through with her young student. Once your student is a fluent reader and has good reading comprehension, this method would likely work quite well. However, even as a 5th-grader, Ben required some supervision to ensure that he was indeed completing the tasks. 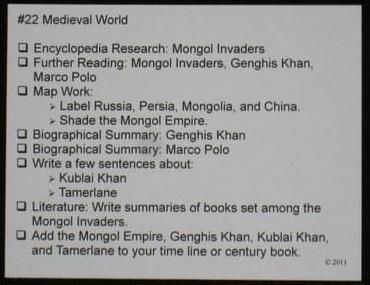 Sometimes, the tasks require teacher involvement–narration of the readings, for example. But I do think that over time, Ben will grow more and more independent and require less supervision, as he builds confidence and takes more ownership in his home education. I can certainly see this as a valuable tool for fostering at least some independence him. I liken it to the assignment sheets I have used with Ben this year,only with everything already filled in for me. This system is also quite unit study friendly, which meshes well with our current preferred homeschool method. It can certainly be adapted to work well with other methods as well. As Ben completed each task, he was able to place a check mark next the Task Card assignment. He actually enjoys having checklists, so this method worked well for him. He also enjoyed some of the more “hands-on” projects that our homeschool has been missing lately. We were inspired to finally begin that timeline we’ve been putting off! I love that there are no fill-in-the-blank, multiple choice kinds of activities. Students are really pointed toward developing and using critical thinking and research skills with this open-ended approach. Task Card Sets are available for several historical periods, geography, science, art, and music. Prices range from $18-20 per set or $65-90 for subject sets. Currently there is a “MidWinter” sale with FREE domestic shipping for orders totaling $36 or more. Use the code: MidWinter. The TOS Crew has been reviewing several different Task Card Sets from Creek Edge Press, so be sure to head over to the Crew Blog to see what they thought. « His light . . .